Benchmark’s newest edition of the Source newsletter is now available for everyone to view. The newsletter includes the latest projects that we have been working on and future software features that you should know about. 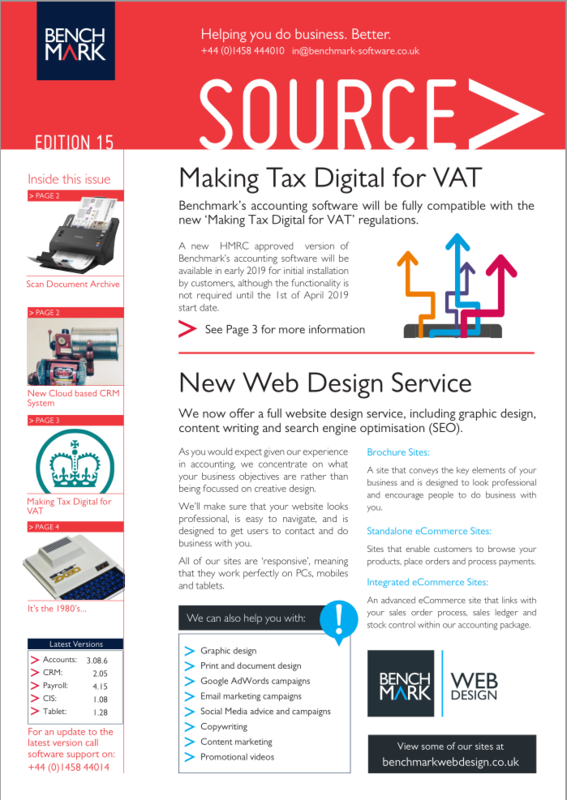 Most notably in this version of the newsletter we explain a bit about the Making Tax Digital for VAT changes that will be added to our software to be compatible. Since our last newsletter we have made significant additions both to our company and the products we provide. We have built a new Cloud based Customer Relations Management (CRM) package to offer a cloud solution to our current Cream software. We have also added a new area to our business by taking on an experienced Web Developer, allowing us to create fully integrated Ecommerce websites and build bespoke Web Applications.